Spring is in the air and in Spring, many people all over the world celebrate Easter. 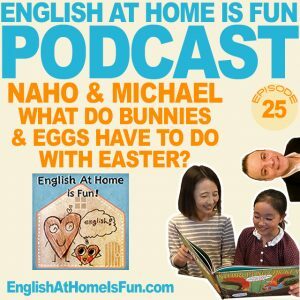 Naho did some research for us and found out why Easter is celebrated with eggs and rabbits! We’re going to chat about that and of course, we have an awesome knock-knock joke for you. We hope you like it. For today’s Podcast, Naho and Michael chat about Setsubun, the traditional festival in Japan that happens in February. It involves roasting and drying soybeans, then scattering them around the house and then…well, you’ll need to listen to catch the whole story. We hope you like it. 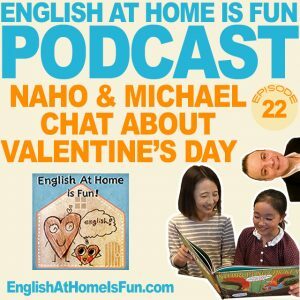 22 – Naho & Michael Chat About Valentine’s Day Traditions! This is an episode for friends and lovers…we’re talking about Valentines Day. Do you know the Valentine’s Day traditions in the USA and in Japan? They are quite different, actually! Naho also did some research and talks about the history of Valentines day and who Mr. Valentine was! We hope you like it! 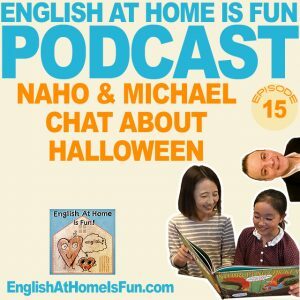 15 – Naho & Michael Chat about Halloween! This week, Naho and Michael talk about Halloween. It’s kind of interesting how kids celebrate this in the USA and in Japan. We also share Naho’s original knock-knock joke. We hope you like it! What a splendid mother she is !!? ?